A recent Verizon commercial shows a Christmas tree made up of touchscreen phones that light up all at once. 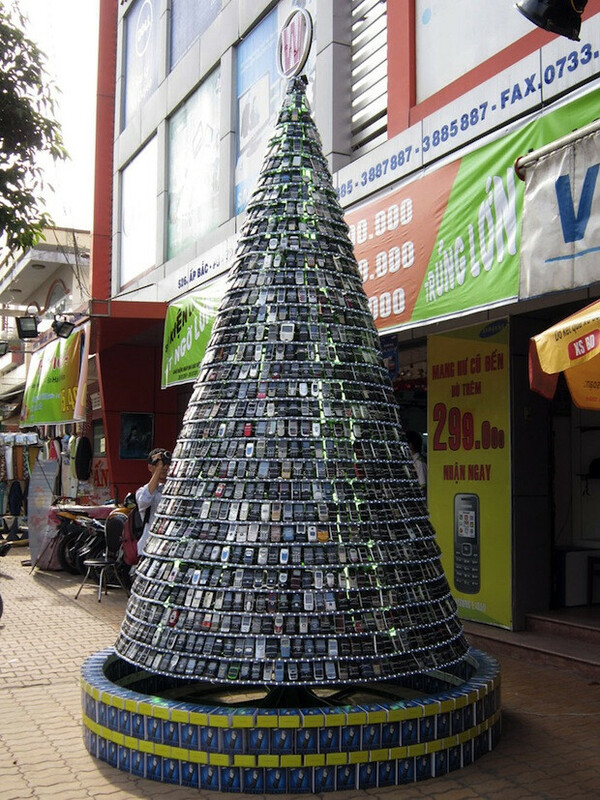 A real life Christmas Tree made up of 2,500 unusable handsets is now on display in Vietnam in front of Westcom Electronics in the southern city of My Tho. The tree took a pair of workers ten days to complete. 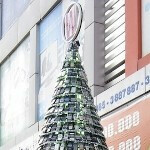 Store manager Nguyen Trai says that the tree was put up in order to focus attention on hazardous waste and promote environmental responsibility. According to Trai, 700 to 800 people come by daily to see the tree and take pictures with it. Cell Phones are everywhere in Vietnam where 60% of the population is under 30 years old and the handsets are seen as a sign of wealth in a country suffering from inflation. There is a Grinch in the story and that is Nguyen Thanh Yen of Vietnam's Environment Administration who says he welcomes the attempt to raise awareness about hazardous waste, but says that Westcom Electronics violated a Vietnamese law that calls for government approval to use hazardous waste for new purposes. Even, it seems, if the hazardous waste is designed to help everyone celebrate the season in good cheer. the people who hark about waste and needs to be green waste the MOST. Its like those idiot prius drivers who drives 85mph on the fast lane... I've seen people who preach protest days on about being green and peace but turn around and liter all over and have huge houses that never has their lights turned off. My point I bet this is just another idiot trying to make some money by harking green peace. Just asking !!! Is anything which is made in the shape of "inverted cone" is a christmas tree ?? Ok cool but only one problem with this...it's CHRISTMAS not Xmas! Jeez it started as Christmas, why not leave it as Christmas? Oh they're so worried that people will get "offended" well I don't care! Merry Christmas! I know this is not the place but things like this just get at me! Gahhh! I mean the name has Christmas, but the pic caption has Xmas??? I see some old school Nokia's in there..